Huber Engineered Woods LLC, a leading manufacturer of innovative building solutions, introduces Texas builders to new ZIP System® radiant barrier roof panels, which are the only three-in-one code recognized structural wood panels on the market. ZIP System radiant barrier roof panels combine strength and stiffness, superior moisture resistance and a radiant barrier to deliver unmatched performance and quality in a single structural wood product. "We introduced ZIP System roof panels over five years ago to provide builders with a high-quality, high performance product. We've extended the value of this proven product by adding radiant heat protection. The new ZIP System radiant barrier roof panels keep energy costs from going through the roof by reducing radiant heat transfer by as much as 97 percent," stated Brent Flotkoetter, ZIP System product manager. "In a market such as Texas with growing code and energy requirements on builders, the ZIP System radiant barrier roof panels provide a solution that allows for faster, more efficient installation with our all-in-one roof sheathing." ZIP System® roof panels have a built-in moisture barrier and eliminate the need for felt paper and H-clips. 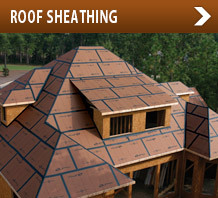 A code-recognized structural panel and underlayment all-in-one, ZIP System roof panels prevent expensive rework due to torn felt, and shingles or tiles can be applied directly to the panels. Since the ZIP System is faster to install than traditional methods and provide an instant 120-day rough dry-in, builders can schedule subcontractors sooner, ultimately completing the house in less time. With the use of ZIP System radiant barrier roof panels, the sun's radiant energy is kept out of the attic which contributes to as much as eight-to-12 percent reduction in home cooling costs and less wear and tear on the home's air conditioning systems. ZIP System® wall panels help create a tighter building envelope that decreases unwanted air leakage and protects the R-value of insulation. When ZIP System wall panels are combined with the new ZIP System radiant barrier roof panels, homeowners can experience a total solution for the most energy-efficient building. ZIP System® roof panels feature a water-resistant barrier that is fused directly onto the panels during the manufacturing process, preventing water from entering between the ZIP System® barrier and the sheathing. The new ZIP System radiant barrier roof panels are available in 1/2" and 5/8" thicknesses. ZIP System roof panels eliminate the need for felt paper and H-clips. A code-recognized structural panel and underlayment all-in-one, ZIP System roof panels prevent expensive rework due to torn felt, and shingles or tiles can be applied directly to the panels. Since the ZIP System is faster to install than traditional methods and provide an instant 120-day rough dry-in, builders can schedule subcontractors sooner, ultimately completing the house in less time. ZIP System® wall sheathing with a built-in water-resistive barrier is a structural wall panel, moisture barrier and air barrier all-in-one, providing a tight building envelope and superior moisture resistance during and after the construction. The ZIP System® tape gun is used to install both the roof and wall products with the ZIP System® tape, which provides moisture resistance for seams, valleys and ridges, can help reduce air leaks as recommended by the Seal and Insulate with the ENERGY STAR® effort, and is code recognized as window and door flashing tape when used with ZIP System® Wall sheathing (ESR-2227).